Federal recognition is supposed to offer legitimate Native American tribes opportunities to control their sovereign lands, form a government and obtain assistance for housing and education. It should not give them inalienable rights to run gambling joints. 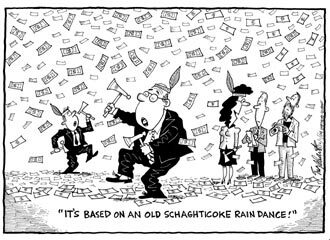 Yet, as U.S. Rep. Christopher Shays of Bridgeport aptly put it, in being recognized by the federal Bureau of Indian Affairs last week, the Schaghticokes of Kent may as well have been handed a license to print money. Although the 273-member tribe's leaders are being coy about their intentions, they are backed by wealthy investors who could bankroll casinos in Danbury, Bridgeport or Waterbury. This is not good for Connecticut. Another gambling palace anywhere in the state would be disastrous. The Schaghticokes are the fourth tribe to be recognized, with more applications pending. The state must stop this slot-machine tsunami. It is stuck with two casinos that attract millions of customers a year, clogging highways. That's enough. The majority of Connecticut residents don't want their state to become Las Vegas East. They don't need more traffic congestion. Moreover, towns cannot afford to lose more of their tax base or zoning control to tribal annexation of land. The Schaghticokes have a pending land claim of more than 2,000 acres in Kent that they hope to annex to their existing reservation. Attorney General Richard Blumenthal, with the backing of Gov. John G. Rowland, vows to appeal the Schaghticoke recognition, as he has done with a similarly constituted tribe, the Eastern Pequots of North Stonington. In both cases, the Bureau of Indian Affairs has knitted together disparate factions and called them unified tribes. For his part, Mr. Shays was too quick to concede defeat, saying that nothing can be done in Congress to stop this questionable tribal recognition process that is controlled by Western states. Connecticut's congressional delegation has an obligation to fight casino sprawl. It has a growing stake in ensuring that the tribal recognition process is fair and aboveboard. The process is a joke today. Finally, state leaders have some legal ammunition with which to fight the expansion of gambling. Last year, the legislature got wise and repealed the pernicious "Las Vegas Nights" statute that enabled the existing casinos to be developed. Federal law allows Indian tribes to offer gambling already permitted under state law. Because none is now permitted, let the courts decide if the repeal is enough to bar other casinos. Are casinos "joints" or "palaces"? Or both? The Courant can't make up its mind whether casinos are low-class or high-class. Either way, the editorial's language makes them sound bad. Would the Courant use either of these descriptors for a Wal-Mart? Probably not. Clearly, the newspaper is biased against casinos. Three whole casinos make up a "tsunami"? California has some 50 Indian casinos and Arizona has some 20, yet they're not facing a tsunami of slots. This tsunami is more like a trickle. The propaganda here is too, too obvious. A steady stream of slots is neither dangerous nor irresistible, but a tsunami is both. A similar choice of words would be stampede, onslaught, or avalanche. Look out, here comes the slot-machine armageddon! Judgment Day is upon us! The concentration of casinos in Connecticut can't be much worse than in Atlantic City, yet no one in the latter is complaining about millions of customers clogging the highways. If Connecticut needs better traffic planning, maybe the people of New Jersey can help. If the majority of Connecticut residents don't like Indians in their midst, they can give back the land their ancestors stole. Otherwise, they can experience what the Schaghticokes experienced when strangers set up shop in their neighborhood. "The Bureau of Indian Affairs has knitted together disparate factions"...so would the Courant prefer the BIA to recognize the factions separately? That would mean two groups that could open casinos, not one. "The process is a joke today"...why? Because the Courant doesn't like the results? The lack of substance makes this article a joke.